Have a wonderful Christmas everyone! Thanks for all your comments, friendship, and love over the past year. I'm taking the rest of the week to enjoy my family and celebrate Christmas. See you after the Holidays! Hey everyone! You getting ready for Christmas? All your shopping done yet? I have more shopping to do this week, and with the kids home, it will be crazy I'm sure. It wouldn't be Christmas without a little crazy though... right? This is a quick easy gift card holder. I used mostly scraps to make the entire thing. You all know I love the Colorful Christmas paper pack from MME... so I got busy and threw together a couple gift cards. I HAD to use up every piece of that wonderful paper. The band across the bottom holds it closed, so when you take that off, the card pops open and a gift card is in the center. 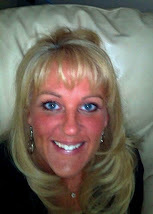 My friend Lana did a great tutorial, click here to see. Another talented friend, Nancy Morgan made one card sized, which you can see here. 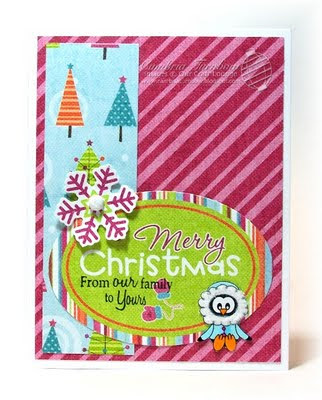 Paper: Pink Passion, Colorful Christmas Paper Pack by MME, Kiwi Prism, Neenah White. Other: Chunky Sparkles, Glossy Accents, Blue Gingham, Cuttlebug Embossing Folder, BG Rhinestones, atyou Spica Pens, circle Punches, Scallop Punch, Oval Punch, Zip Dry, Scor-pal. We made these fun CD holders down at Memories of Time for Michelle's VIP night. Super fun, and super easy. Perfect to share some holiday tunes or a CD of photos for family and friends. My favorite way to close the flap is to use Snap Magnets.... they are small and not bulky, you can hide them under the cardstock so when the flap "snaps" shut... it seems like magic. I did not plan far enough ahead, so we had to use Velcro tabs for these. I will share a couple more I did tomorrow. These are SO easy to make. My friend Ang Fab shared this with me at a stamping retreat years ago. 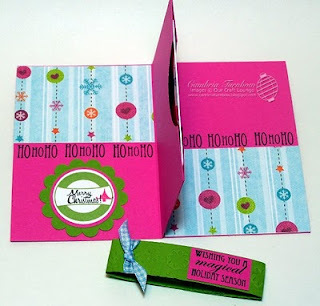 Start with an 8.5 by 11 piece of cardstock or two sided designer paper. Cut long ways at 5 1/8 (so you have a piece that is 11 x 5 1/8) Score this piece at 2.5 and 7.5. Cut the left over strip down to 7 1/8. Score each end in 1 inch. This piece goes in the inside to hold the CD in place. Adhere it to the front pocket applying glue to the 1 inch strips you scored. Add Zip Dry to the back and close it shut. I will try and get a tutorial written up after the holidays, but if you have any questions, just shoot me an email. We used Snowflake Nestie dies to make the snowflakes and added little Kaiser Pearls for the centers. 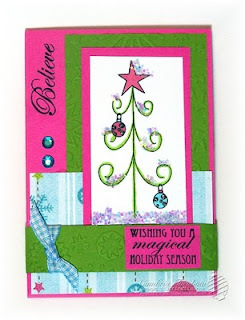 We stamped Merry Christmas on the CD with Red Stazon Ink using the stamp set Merry Wishes. The designer paper is from Imaginisce called Polar Expressions Sugar Sprinkles... it has all kinds of glitter on those dots! We used the stamp set Snow Place Like Home. I know, I know, MORE penguins... I can't help it... I love them! During the holidays, I always need easy things to stamp... and this will carry through after the holidays for quick thank you's too! These penguins came from the Copic Penguin Kit, which is available at Archivers and a few other stores, including my LSS, Memories of Time. Tomorrow I will show you a really easy CD holder we did at Michelle's (the owner of MOT) VIP night. They are the same penguins that are in the set called Snow Place Like Home.... only you don't have to do any masking to get the hat and scarf on.... but you also get the adorable igloo. 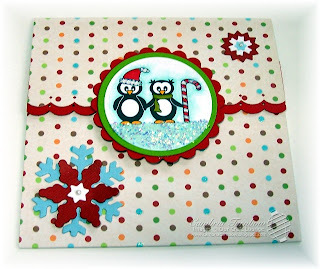 The cardstock is from Prism, the designer paper is from my favorite holiday paper pack called Colorful Christmas by MME. I also used a snowflake Cuttlebug folder to emboss the background, and the sentiment stamp set called Merry Wishes from Our Craft Lounge. Of course I also used Sparkly Fluff applied with a Quickie Glue Pen, and our Chunky Sparkles applied with Glossy Accents to make that fun chunky snow. Hope you are surviving the Holiday madness. I'm almost done with my shopping. I can't believe it's next week! Thanks for stopping by... I'll post the CD holder tomorrow. Merry Christmas! Hello everyone! Welcome to Beate's Weekend Sketch! I'm sorry I've been MIA. The holidays are just so busy and my work load has been crazy too. I hope you are all staying warm and finding time to create. I cheated this week... but I didn't want to miss another sketch challenge! I grabbed my all time favorite Colorful Christmas Paper Pack from My Mind's Eye and popped out the die cuts for the oval piece and the snow flake. The designer paper is also included in the pack. It's doubled sided so I used the same piece. 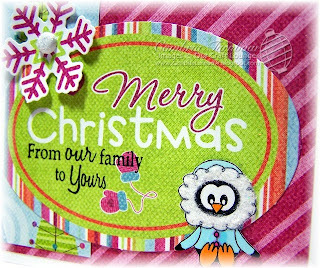 I DID stamp the adorable little Parka Penguin and the sentiment From our Family to Yours (from the set Merry Wishes). I used a brad to attach the snowflake and covered it with Quickie Glue and sprinkled on Sugar Sparkly Fluff. Of course the penguin's cute little parka needed some too.